Beer and durian, a dangerous combination? OK, I confess. I had a piece of durian and a sip of Tsingdao Beer tonight. I like eating durian, even though it is expensive. Its smell is tempting and its flesh is more delicious than a delicate cake. In contrast, I am never a fan of alcohol and I even think I am allergic to it. It’s so hot today, and I decided to break my beer-fast and had some. I drank a couple of sips of beer, and I had a piece of fair-sized durian. Thinking of how to finish the overwhelming remainder of the beer, naturally as a Chinese, I also became curious to learn if the durian and beer conflict in their food nature. I have been told by a number of people that beer can be fatal, if drunk within a few hours of eating durian. This is apparently on account of some fermentation process, which causes your bowels to explode. However, based on my own experiments, this rumor appears to be totally untrue. So why do some people say the combination is fatal? Don’t have durian with alcohol. Both are hot and dry in their food nature, and if you eat them together, your blood vessel will be blocked and even explode. A stroke may also occur. I also found some testimonials, as the one already quoted above, which say that it is absolutely ridiculous to believe that durian and beer can kill. Nothing happened, says the brave ones, after they took the two together. Many durian lovers shared their experience about how to bring the best of durian. A durian is as much nutritious as three chickens. Cook durian with rice and some coconut milk. Mix durian with sugar, milk and cream to make durian ice cream. Eating durian with the Queen of Fruit — Mangosteen — to neutralize the heat of the King. My parents like to smell the bottom of the stem. If it emits a strong smell, then it’s ready to consume. Some people prefer the tapping method. Hitting the fruit with a stick and hearing the appropriate slightly-hollow “thunk” sound. Of course, this is something you’d have to learn from a durian jedi. I decide to stay on the safe side and stop drinking the rest of the beer. I don’t like drinking beer anyway. I’ll try some chilled-tea next time. It is of such an excellent taste that it surpasses in flavour all the other fruits of the world. Durian’s taste divine! It’s soft and mushy and has a very unique taste that you can’t really describe. Kinda apple custard, kinda longan, kinda something else. It tastes very different when cold, defrosted or preserved. As I am planning heavily to study hospitality management and trying to make a career change in this area, news about hotels and tourist industry have been getting my attention recently. Reading a few posts on the Internet, I feel St. Lucia seems to be a nice place to go, maybe I can try to find a job there after I graduate. Update: It turned out that St. Lucia was just another fancy of mine, and now it seems so remotely unattractive. How I execute mosquitoes? Electrocute them. I kill mosquitoes with such cruelty that will make Buddhists cringe. Frankly, I only launch wars against roaches, mosquitoes and flies, to list in an order of descending intensity of hatred. The thing is, when I try to have some quiet time at night in front of the computer, armies of mosquitoes take advantage of the occasion and attack viciously to harvest my blood. They hide under the table or in the corners, and mostly target my legs and feet. Turning on air-conditioning will usually quench their blood-thirst for a while, but didn’t do the trick this time. I also can’t bear the smell of the poisonous heaters with repellent tablets, so I decided to get a new weapon to defend myself. 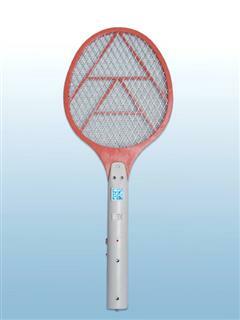 This advanced weapon, or WMD, to borrow Mr. Bush’s catchphrase, looks just like a badminton racket, only heavier and bulkier. Once mosquitoes are caught on the net, the metal wires will spark and make a loud cracking noise, announcing the demise of a tiny insect vampire. But the drawback is I have to constantly distract myself from what I do to hunt them down. Well, it is June 4th and I have to write something on the Internet. invent something to fill an empty show slot. Of all the characters in the Avatar story, I really like the Uncle of Zuko. Follow your passion, Zuko, and life will reward you. finishing my Ph.D because it is not my passion. I did get a second chance. to the cosmos power — let go of fear, recognize yourself and come to peace with your past. I know this is a bit late to make resolutions at this moment, but I still have time, don’t I? These are the things I really want to do and achieving any of them will make me look back this year with contentment. The aims are somewhat tuned down in case I fail shamelessly. reduce some weight, say, ten pounds. I am fat and I know it. I’ll start with swimming and improve my breast stroke. learn to configure Linux servers on Debian environment. I have to break the mysteries wrapping around the server configurations. finish my Ph.D. I know it is not easy, but I have to finish what I have started. drive the traffic to this blog over 200 unique visitors per day. make some extra money. This has never been my goal up till a year or two ago. I realize I can’t keep cynical. Sleep early (12!) and brush my teeth twice. Morning brushing is not enough. buy a mobile phone if I don’t go to the U.S.A this year. read a few good books, especially those about political philosophy. set up a social-networking website and see what I can do about it. be a little adventurous. Take a little risk at a time. I am paranoid and overly cautious sometimes. They are in the new fish tank at my home merely by coincidence. One day on a daily walk to the neighbor shop, I noticed the small pond at its entrance was no longer maintained and the water in it was very dirty. The four fish inside were obviously in the ‘troubled water’ and on the verge of dying. Then I asked a shop assistant why the shop didn’t change water and perhaps feed the fish. He replied “We don’t want them anymore. Anyone can take them home”. I had no plan at all to feed a few fish at home, but I didn’t want them to be left to die like that. So I used plastic bags and carried them home — not without a price — I helped empty the pond water for the shop. I was thinking returning them to nature and putting them into a pond next day. But next morning we changed the mind and bought a tank for them. The tank is certainly small for these pond fish, but they look happy living inside. They should be happy and even celebrate. I saved their lives, I feed them daily and I change water and clean their droppings regularly. What else can they even demand? PLA: it is the acronym of People’s Liberation Army of China. My son was reciting his nursery songs about the brave PLA soldiers. Naturally, a name readily on his mind was PLA. It is the smallest in the pack. Yesterday I introduced two more fish into the tank. 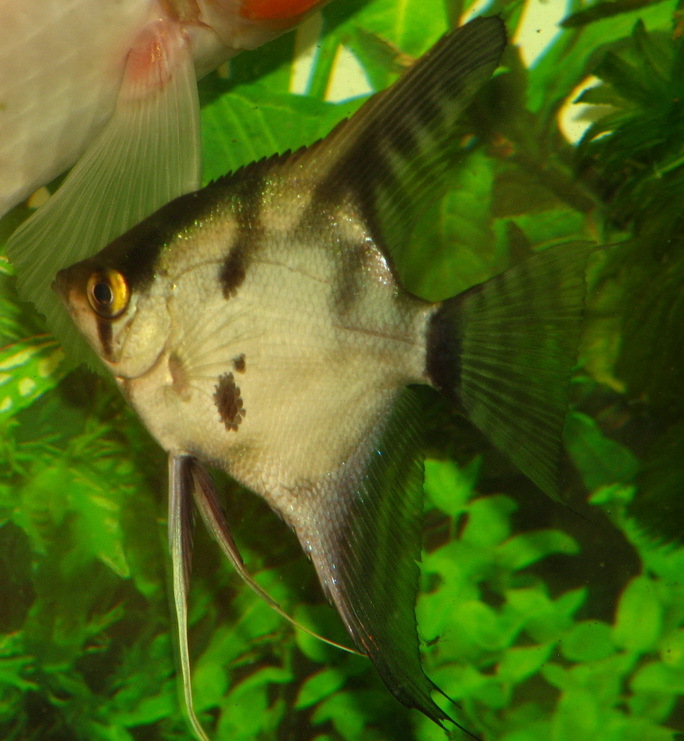 They are called ‘cleaner’ and they feed on the microorganisms grown on the glass surface of the tank. 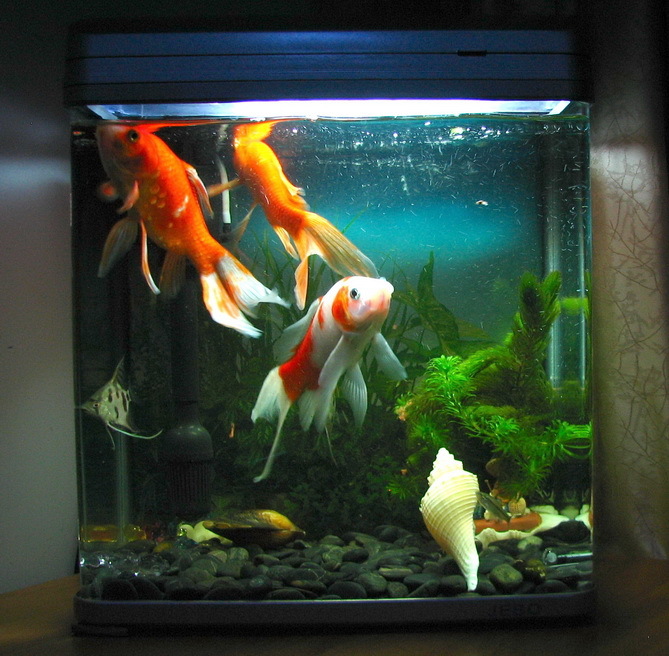 Biofouling is the technical term for the entropy of a fish tank surface. These cleaners do the dirty job by razing the tank surface with their mouths and they can hang on the glass with their powerful vacuum-cleaner mouth. They are very cheap to get. 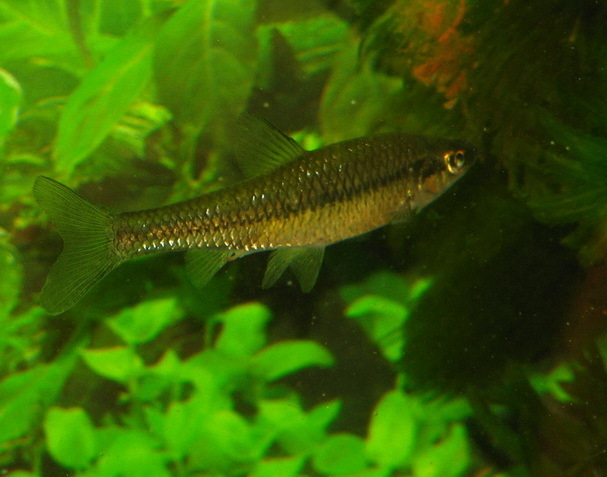 The ones I have are small and they fear to be eaten live by the four ‘aristocratic’ fish with titles. As a result, they hide behind the water pump and only perform their duty in that safe zone mostly. They will acclimate to this new fish world and forget all the fear and injustice. The "Immortal Fish" called by the vendor. Do you happen to know its real name? It may even be a good sign of abundance for the New Year. Because ‘fish’ is pronounced the same as ‘surplus’ in Chinese, and the phrase ‘I have fish’ can be conveniently romanticized into ‘I have surplus’. Chinese have a custom of eating fish on the New Year Eve for the same reason.